Species profile prepared by E. Hansen, P. Reeser, and W. Sutton. Phytophthora chlamydospora Brasier and Hansen is found in streams and wet soil worldwide and is a pathogen of some riparian tree species as well as horticulturally valuable fruit and nut trees and nursery stock. It is self-sterile, and produces persistent non-papillate sporangia, usually on unbranched sporangiophores. 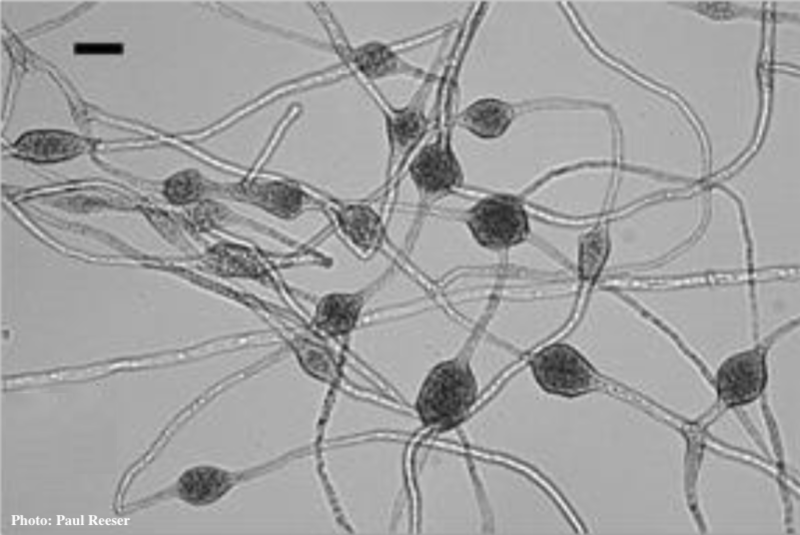 Chlamydospores are formed most regularly at warmer temperatures. First isolated in 1971 from waterlogged roots of an ornamental Prunus in Gloucestershire, UK, it was tentatively assigned to P. gonapodyides Petersen (Buisman). Similar isolates from Britain and North America were collected and subsequently compared using DNA-based approaches. 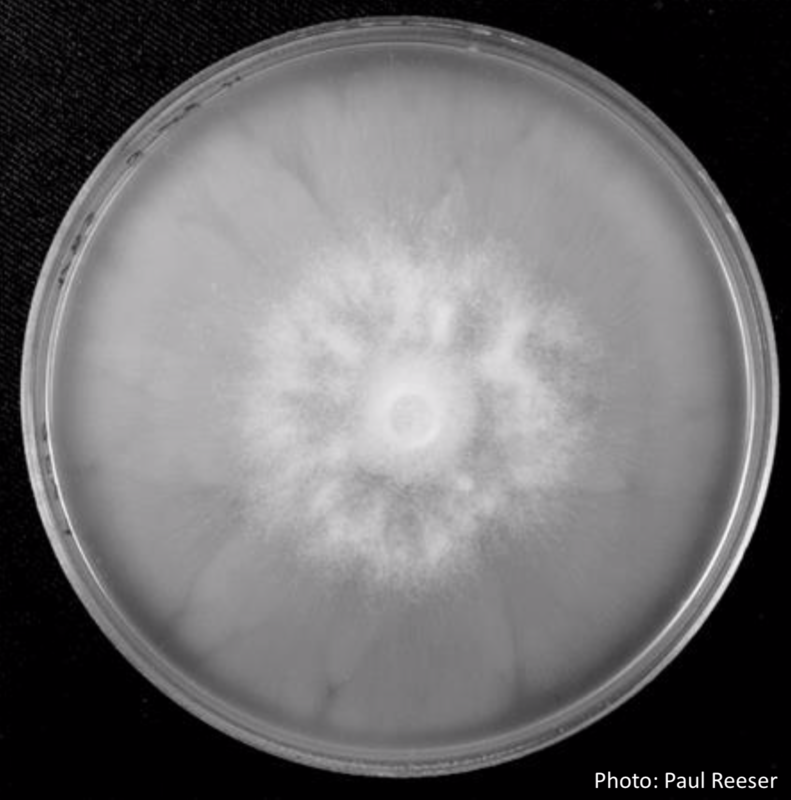 The UK Prunus isolate and some isolates from nurseries in Oregon and Washington, USA produced large thin-walled chlamydospores in culture and were considered to represent a separate taxon from the non- chlamydospore-forming P. gonapodyides (Brasier et al. 1993). The chlamydospore-forming group was informally designated Phytophthora taxon Pgchlamydo. P. chlamydospora sp. nov., was formally named in 2015 (Hansen et al. 2015). Etymology: “Chlamydospora” refers to the distinguishing chlamydospores formed especially at higher temperatures. The earlier informal name of “taxon Pgchlamydo” recalls its similarity in culture and habitat to P. gonapodyides. Chlamydospores formed in agar media may be scarce at 22° C but are usually abundant at 28° C. Chlamydospores are mostly intercalary but lateral, terminal and sessile chlamydospores are also observed (Figures 1 a,b,c). Clumps of large globose to subglobose hyphal swellings in branched chains are usually formed in water (Figure 1 d). 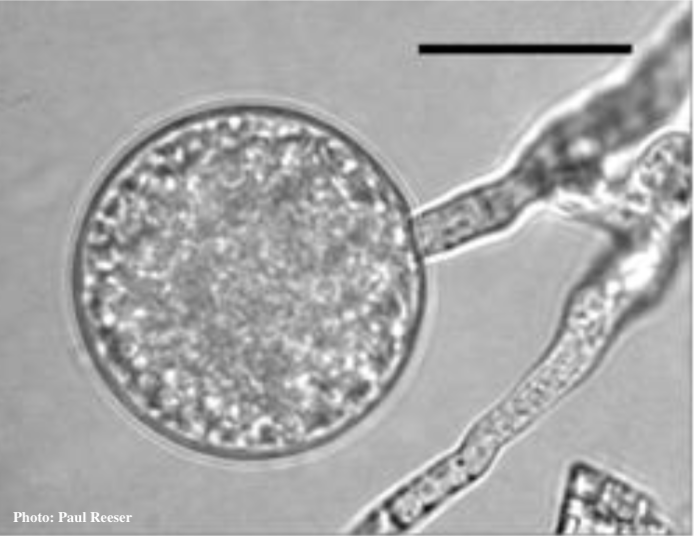 Sporangia are formed in water on simple, unbranched (occasionally sympodial) sporangiophores. They are obpyriform or ovoid, often somewhat elongated, non-papillate, persistent (non-caducous), with internal proliferation; average 56 μm by 36 μm, length: breadth ratios from 1.5 to 1.7 (Figure 2 a-d). Gametangia have not been observed in single isolate culture i.e. P. chlamydospora appears to be self- sterile. Some isolates exhibit a relic of heterothallism, remaining self-sterile but acting as a ‘silent’ A1 compatibility type, inducing gametangial formation in A2 isolates of other Phytophthora species when paired directly with them or via a polycarbonate membrane (Brasier et al 1993; 2003). 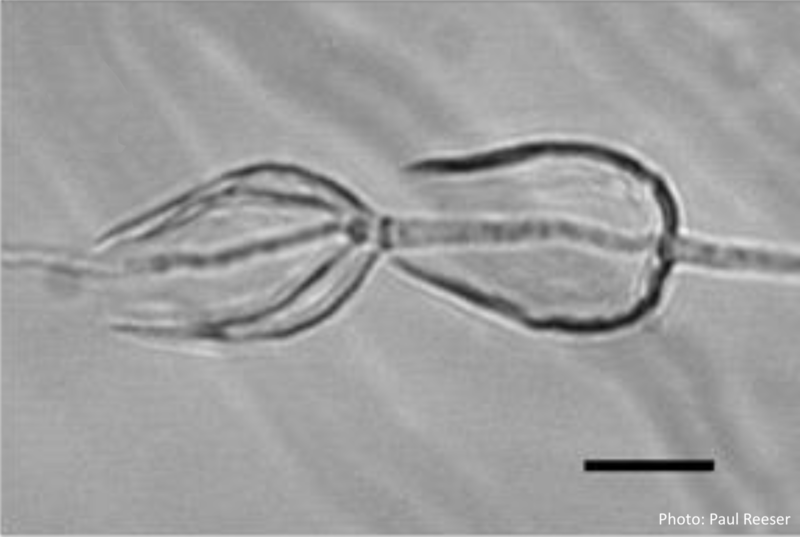 Isolates of Phytophthora chlamydospora form a monophyletic clade within Phytophthora ITS Clade 6 (Figure 4) although with considerable variability expressed as “double peaks,” perhaps representing past hybridizations with other clade 6 species. Hybrid isolates are common in some situations. Nagel et al. (2013) have produced molecular and phenotypic evidence for local emergence of hybrid swarms between P. chlamydospora and P. amnicola, or between P. chlamydospora and P. thermophila in Australia and South Africa. 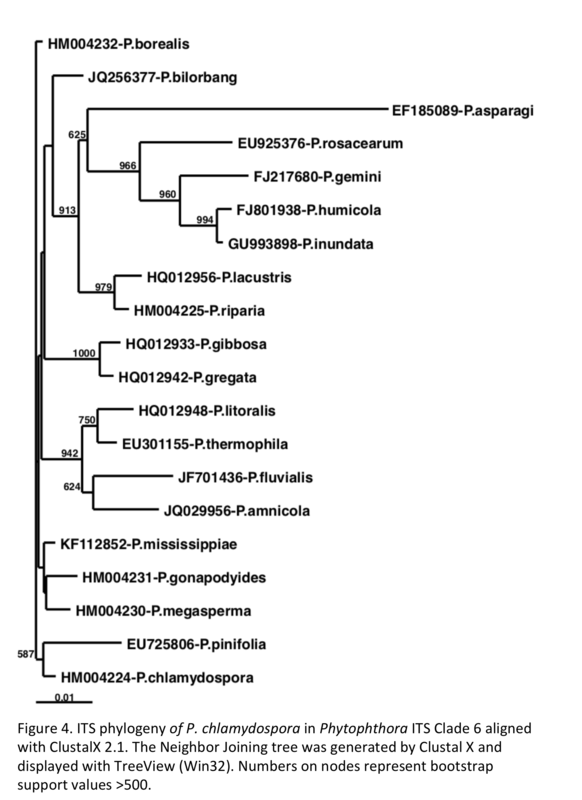 Several multilocus genotypes of P. chlamydospora have been identified. Isolates with sequences identical to the type isolate, which lacks double peaks in both ITS and β-tubulin gene regions, are most numerous and are present in both Europe and western North America. The second most frequently encountered multilocus genotype is also found in both Europe and North America. The third genotype was found in five isolates from Argentina. Despite this variation, P. chlamydospora can be distinguished from all other known Phytophthora species by the similarity of its DNA sequences of the ITS, COX spacer, and β-tubulin gene regions. Phytophthora pinifolia and P. borealis are sister species to P. chlamydospora. The three species are readily distinguished by growth rate, optimum and maximum temperature, and colony morphology, as well as chlamydospore formation. In addition, P. pinifolia exhibits a tendency to cauducity in culture, not observed in P. chlamydospora. Temperature optimum in vitro mostly ranges from 25–28° C. Maximum temperature for growth is 36° or 37° C. Growth rate on carrot agar at 25° C ranges from 3.2 to 4.1 mm/d (Brasier et al. 2003). 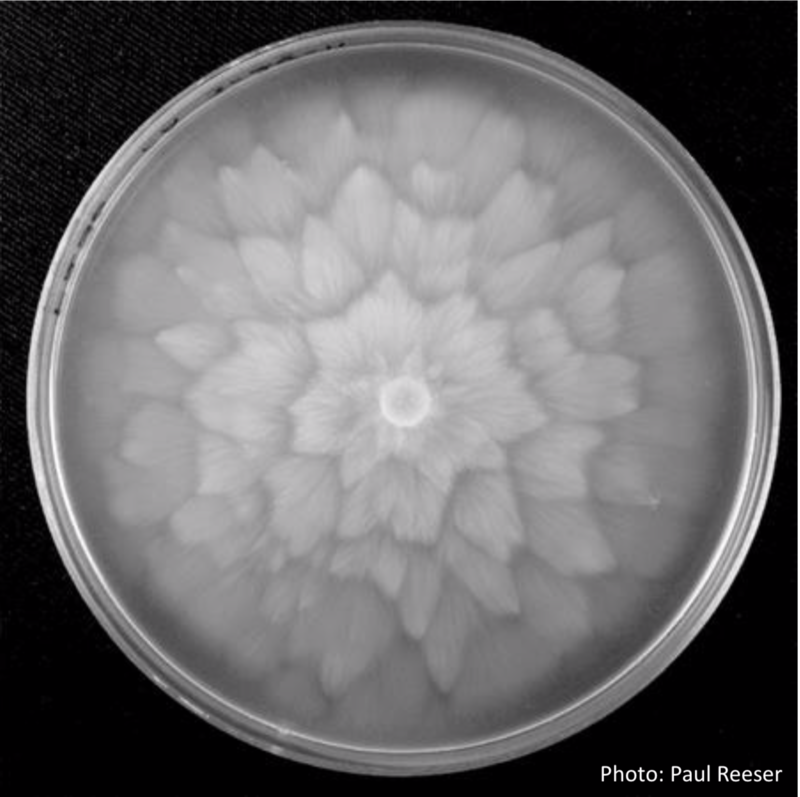 Colonies on carrot agar are petaloid, very similar to P. gonapodyides (Brasier et al. 1993, 2003) (Figure 3). Phytophthora chlamydospora is rather nondescript in culture. It long has been confused with P. gonapodyides. Because chlamydospores may not form at lower temperatures this distinguishing feature is not always available. Sporangia usually form rapidly (within 24 hours) in water but are not easily distinguished from those of other non-papillate species. Phytophthora chlamydospora can be misidentified as P. lateralis because of its combination of large, sometimes laterally-attached chlamydospores and non-papillate sporangia, but it tolerates much higher growth temperatures. Phytophthora chlamydospora is itself sterile, although it may induce gametangia in A2 isolates of heterothallic species. 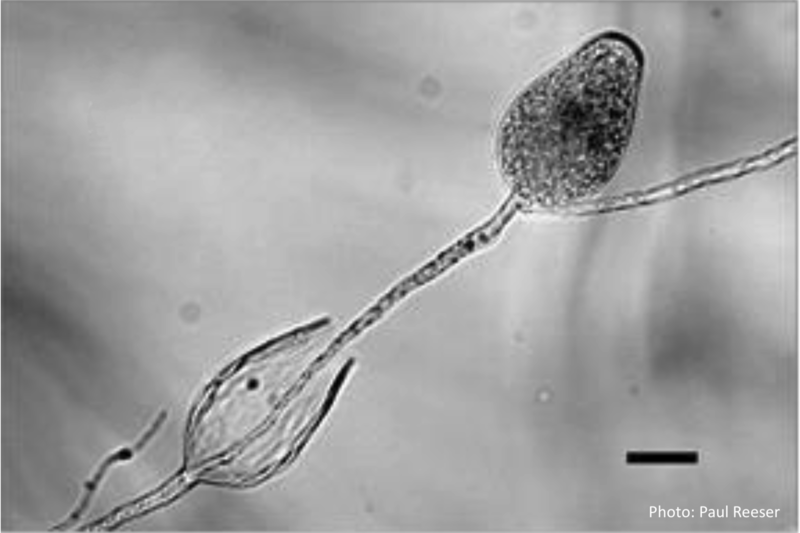 Without carefully controlled mating tests to determine which isolate is producing gametangia, it often has been assumed to be heterothallic and consequentially misidentified as P. drechsleri or P. cryptogea because of its colony morphology and non-papillate sporangia. Clumps of large globose to subglobose hyphal swellings often are observed in water and can be a useful identifying feature. These clumps are sometimes large enough to be visible to the naked eye. Isolates examined from China, Europe, North America and Argentina have been indistinguishable morphologically. For more information about Phytophthora chlamydospora, visit our Disease, Education and Management materials, and Reference sections.